The images that really stand out for the families you photograph are the ones where endearing moments are captured. You can set your family up for what you think will make the most gorgeous photo, but if their hearts aren’t in it, it will fall flat. The best part of emotive images is how they speak to the client in such profound ways. The small moments that represent their relationships with each other in this exact moment are the ones that are photographed and make the memories they will relive each time they look at the images you took for them. Creating these images is easier than you think, but requires keen observation and a little know-how to make it happen. I am sharing my top 5 tips to create emotive images that will draw in the viewer and make your clients relive each moment as if it just happened. Chances are you’ve had a consultation with at least one or two members of the family so you have a little bit of inside knowledge on the vibe of the family and a bit of their family dynamic. But as soon as the entire family is together, the vibe totally shifts and you need to be ready to take the knowledge you have of the family and pair it with what you see the day of the shoot. The moments we are walking from their vehicle over to the shoot location is when I get a general sense of what role each person plays in the family dynamic. You can see if a dad is totally wrapped around their fingers of his daughters, which means sweet and tender moments with flow freely. You’ll understand if a child is more of a momma’s boy and caters to her needs. These little telltale signs are going to guide how you photograph the session and what kind of prompts you will give to the family. Take advantage of those first few moments together and soak in any knowledge of the family you can. Just watch and see what unfolds. People gravitate to what is comfortable for them– the things they are familiar with that they always do. A session with a family is no different. You’ll notice who the children gravitate towards (mom, dad, or even another sibling) and you’ll see little quirks that come out (like playing with hair or jewelry). Being observant means you’re watching for the subtleties that make a relationship unique. There was once a session I shot for a family where the 12-year old son was so infatuated with his mother. He would go out and find heart-shaped rocks and bring them to her. He just loved her so much. Through being observant and letting moments unfold organically, I was able to capture this beautiful moment between the two of them. And to be the icing on the cake, he found a heart-shaped rock for me, too! When in doubt, watch the hands. 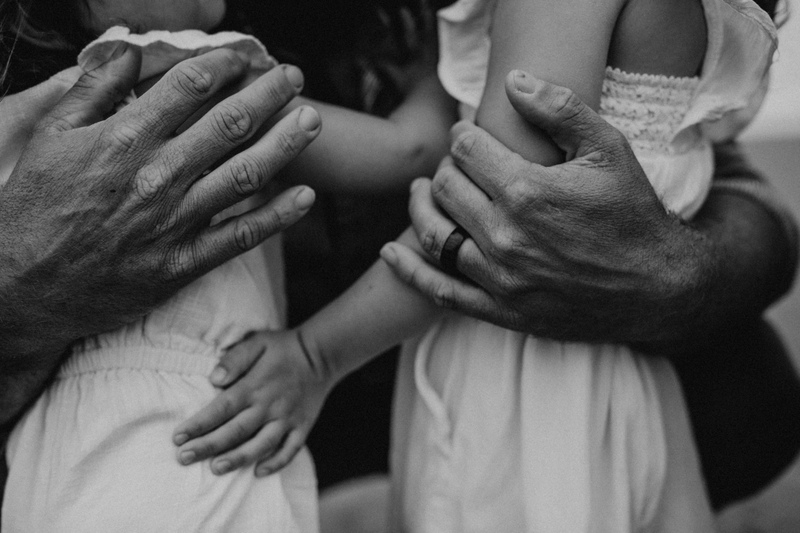 Little fingers reaching for their momma’s face, the big hands of dad cradling his baby girls hands, the guiding and protective hand of a mother reaching back as her little ones run to catch up. Hands can show so much emotion and direct your focus. Watch for the hands. I once had a client whose son kept playing with her necklace which she was holding him. She would try to get him to stop for a nice photo together when I went up and asked her, ‘does he always do this?’ She said yes so I encouraged her to just let him play. I’ve heard from her since our session together and her son no longer plays with her jewelry when she holds him. She expresses so much gratitude to me for being able to capture such a tender moment for her. Watching his little hands guided this shot and it turned out beautifully. Watching moments unfold organically is great, but sometimes your clients need a little extra nudge to get the ball rolling. It’s totally okay to ask them to do little things to prompt that authentic interaction. If kids are being a little wild, I’ll ask them to listen to their mom’s heartbeat or I will ask the mom to sing their child their favourite song. This slows things down, even for a moment, to capture some of those beautiful emotive images overflowing with connection. I’ll also ask the parents to share the birth story of the child with them. Kids love hearing stories about themselves. I’ll ask the kids what their favourite thing to do with their mom or dad is! It could be play-wrestling or being thrown in the air or playing tag. Fun activities help the kids blow off some steam so we can get those dreamy, emotive, up close shots later on. I will ask the parents if there are certain things their kids are always doing, like playing with their hair or tracing the shape of their chin. Just those little subtle things they won’t do forever. Jensen used to twirl and curl his hair– his hair is too long now so he can’t anymore, which makes me so grateful I have images of those moments I can look back on. I want to capture those moments for the parents so they can look back once their kids outgrow their habits. One key thing to ask is asking the dad to talk about their favourite moment with their kids so far. For older kids (pre-teen or teen), ask them what their favourite thing about each parent is. TIP 5 – Don’t put your Camera away! This is probably one of the most helpful tips I can offer you. Do not put your camera way until you’re in your vehicle and on your way home. Usually when you say ‘alright! We’re done!’ is when suddenly everyone relaxes that little bit more and feels free to really be themselves. These last few moments together can create some of the best shots! I will keep my camera ready until I’m actually back in my car and I see the family in theirs. Then I’ll pack it up. When the shoot is ‘over’ no one feels the need to perform, parents snuggle kids and tell them they did so great for the images, the dad’s cut loose, it’s just a beautiful time to watch and capture some authentic engagement. These 5 tips will really help you create emotive images that speak to your clients. They will look back at the photos you took with a fondness of that exact moment in time before life continued to happen and the moments they took for granted became memories. Try out a few of these tips and let me know how they work for you. If you want to learn more about how I create emotive images, join my newsletter and keep an eye out for more info regarding my class Unbridled Chaos— a 3-month family photography mentorship that will be open for registrations Dec 1st!